Multiple sclerosis (MS) is a chronic, frequently debilitating neurologic disease that is most often diagnosed at a relatively young age. The disease lasts a lifetime, and involves a wide range of issues, some disease-related and others the result of living and aging with a chronic and sometimes disabling condition. 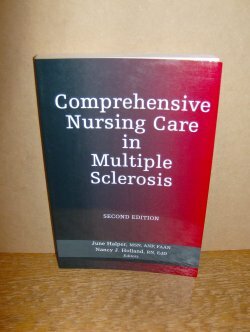 This superb volume is the only definitive text on the comprehensive nursing care of people with MS. As the most direct link to patients and their families, nurses are in the unique position of providing a conduit for physicians and other health care professionals to work with patients, their families, and the community. Nursing care in MS is a collaboration between the patient/family and the nurse, a partnership whose goal is self-awareness and self-responsibility; whose activities involve a great deal of self-care. This book is not simply a nursing text - the lessons that it imparts will be useful in many fields of chronic disease management. The book opens with an overview of multiple sclerosis and its implications for nursing practice; a discussion of theoretical concepts, research, and clinical trials; and an overview of symptom management. This is followed by chapters dealing with specific areas relating to nursing management of the person with MS, including the management of elimination dysfunction, the prevention of complications in severely disabled individuals, psychosocial issues, sexuality and family planning, issues of special relevance to female patients, and interactions with rehabilitation services. Of particular interest are chapters dealing with the nursing implications of disease modifying agents, the role of complementary therapies, patient and family education, client advocacy, and hope as a unifying concept in managing this unpredictable disease. Appendices that include an extensive list of resources and medication sheets for all of the most commonly used agents in the management of multiple sclerosis will be referred to constantly.